1st Executive V.P. and co-founder of TWA. "Aviation pioneers, they shared the love of flight, a vision of the future of aviation and a life-long bond of brotherhood. 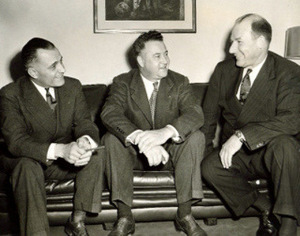 Together, they were known as the 'Three Musketeers of Aviation' and founded TWA "The Airline Run by Flyers," a global airline and an aviation legacy." 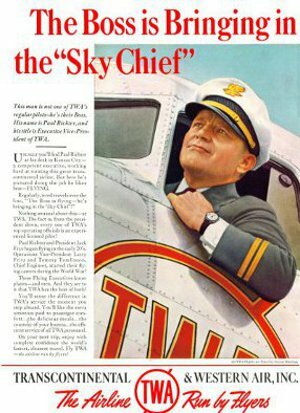 "This man is not one of TWA's regular pilots-he's their Boss. His name is Paul Richter, and his title is Executive Vice-President of TWA. Usually you'll find Paul Richter at his desk in Kansas City-a competent executive, working hard at running this great trans continental airline. But here he's pictured doing the job he likes best-FLYING. Regularly, word travels over the line, "The Boss is flying-he's bringing in the 'Sky Chief!" Nothing unusual about this-at TWA. The fact is, from the president down, every one of TWA's top operating officials is an experienced licensed pilot! 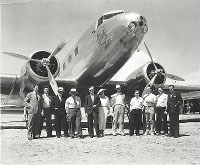 Paul Richter and President Jack Frye began flying in the early 20's. Larry Fritz, Operations Vice-President, and Tommy Tomlinson, Chief Engineer, starting their flying careers during the World War! These Flying Executives know planes and men. And they see to it that TWA has the best of both! You'll sense the difference in TWA's service the moment you step aboard. You'll like the extra attention paid to passenger comfort...the delicious meals...the courtesy of your Hostess...the efficient service of all TWA personnel. On your next trip, enjoy with complete confidence the world's fastest, cleanest travel. Fly TWA, "The Airline Run by Flyers"
1920s "The Golden Age of Aviation"
In 1924 Paul E. Richter, Jr. earned his pilot's license #309. He went on to co-found Aero Corp of California in 1926 and Standard Airlines in 1927. "One of the few veterans of the barnstorming and stunt era who became an executive of a historic airline." The 13 Black Cats were famous airshow stunt flyers and contracted their services in Hollywood for various aircraft scenes in movies. Their prices ranged from as little as $100 for a mid-air transfer to as much as $1500 for blowing up an airplane in mid-air and parachuting out. By the end of the 1920s most of the Black Cats had either died or moved on to other pursuits. Paul E. Richter Jr. was one of the original "13 Black Cats." An amazing legacy re-discovered, an historic aircraft comes home in 2005 and wins awards, invitationals and is featured in major aviation magazines. Bronze Lindy "Antique Transport Champion," Airventure 2006. Best Cabin Monoplane Classic Age, Watsonville and Merced, Ca. 'Fly-ins'. Grand Champion Antique, NWEAA July 15, 2007, Arlington, Wa. "Grand Champion" & "Peoples Choice" Awards, WAAAM Hood River Fly-In.